Windmills have been built by the people of Holland for centuries. Visitors to Holland are often struck by the old world charm and variety of the windmills they encounter. These windmills were used to grind corn, drain water, power saws, hull rice and barley, make chalk and oil, and many other things as well. Join Sharon Hofer as she guides you step by step in creating this beautiful, rustic windmill. 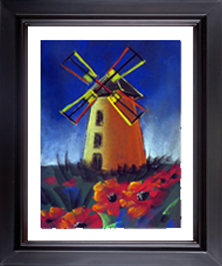 She will teach you the process of planning and then painting this charming windmill in soft pastel.